Character pictures are awesome. I have long loved them. They can be tough to get at times, like this time at Disneyland, but the characters are so great. And right off the bat, one big difference we noticed between Disneyland and the Mouse-In-Law is that at WDW, the characters are everywhere and are always out. At Disneyland, probably because it’s smaller, the characters generally appear and disappear on a schedule I am too lazy to figure out. At the Mouse-In-Law, you can’t swing a cat without hitting a character. Which was pretty cool. Not that you should be swinging at cat at any theme park. Disney does have a kennel for that. One thing I particularly love about the Disney characters is how good they are with scared children. I mean, I kinda get where the kids are coming from, meeting a mute giant anthropomorphic animal-type thing with an oversized head in an exaggerated expression of joy. When you’re like 2 feet tall, I get it. And there certainly are kids who burst out in tears at the approach of a character, which can be almost as frustrating as getting that ever-elusive Santa picture. But the characters are great at approaching in a non-threatening way. I’ve got some wonderful pictures of Theo’s first meeting with Mickey last year along those lines. If the kids don’t want a hug or to get close, the character will offer a high-five, or sometimes just hold out their hand for the kid to touch or look at or sniff if the kid happens to be a dog. 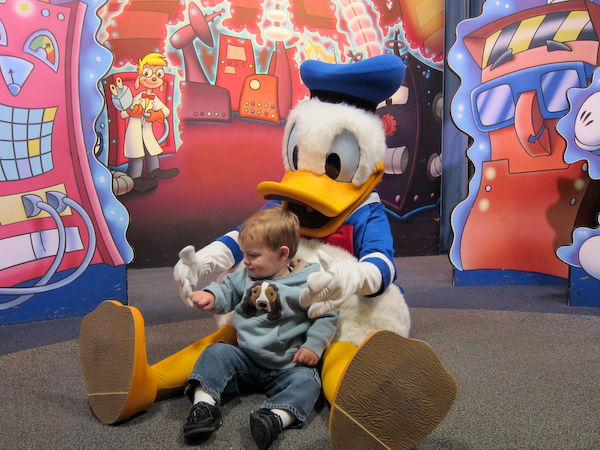 We had a fantastic experience with Donald Duck along those lines that I will show you in just a second. First I want to say that pictures at Epcot were perfect because Mickey and friends were in a single room and there was an inside line with tv’s showing cartoons. Awesome. This was where we took our character pictures. So for Donald, we sent Theo on his own and he was kind of freaked out. 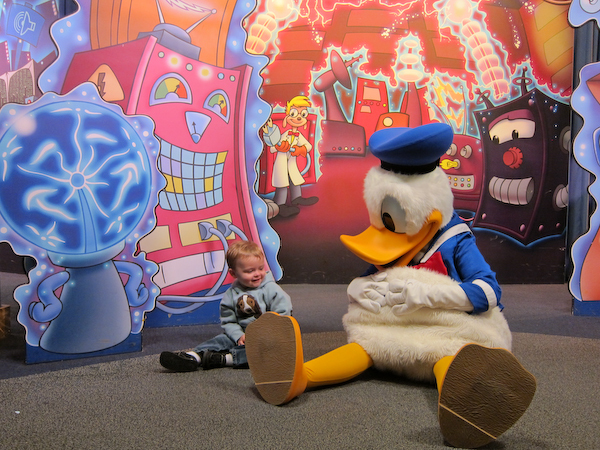 Upon approaching Donald, Theo decided that clearly the next logical move would be to give Donald a hug, give Donald a high five, get near Donald in any way, sit down on the ground somewhat near Donald. 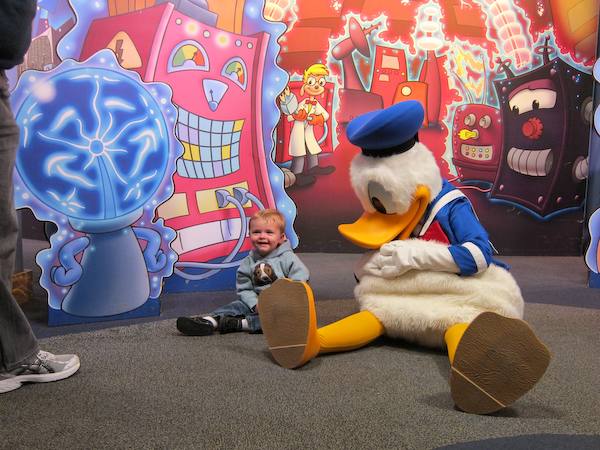 Rather than going over to Theo and looming over him like some kind of freakishly large oddly-attired duck, Donald simply sat down on the ground too. Have a seat on the ground? Don't mind if I do! Theo was a fan, and thus willing to entertain the idea of the giant-thing-on-tv-that-just-came-to-life-OMG-is-it-a-zombie? sitting near him. The ground's pretty comfortable, isn't it? And then we got a simply darling picture. Donald is my friend! And he likes to sit on the ground just like me! 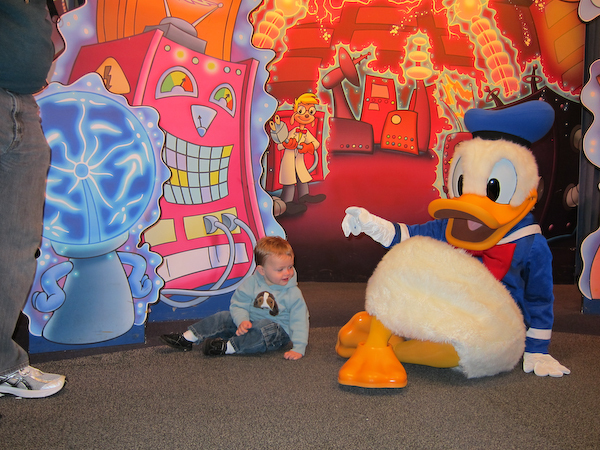 We then coaxed Theo into actually making contact with Donald and giving him a high-five. Actually, Theo learned from his swimming teacher that a “high-five” is a two-step procedure with an open-handed slap following by a fist bump accompanied by a “BOOYAH!” He is now very confused when he gives someone a high-five and then sticks out his fist and they don’t pound it. He’s not quite sure why most people aren’t familiar with proper high-five technique. 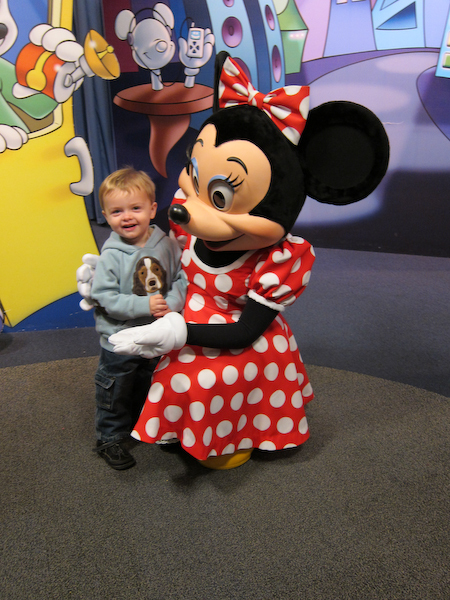 Following the positive Donald experience, Theo was ready for the Ultimate Cute with Minnie. 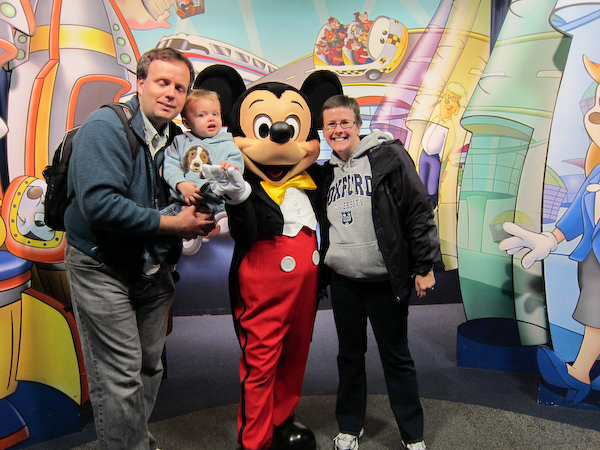 Prior to both Minnie and Donald, we attempted to take the family picture thing. 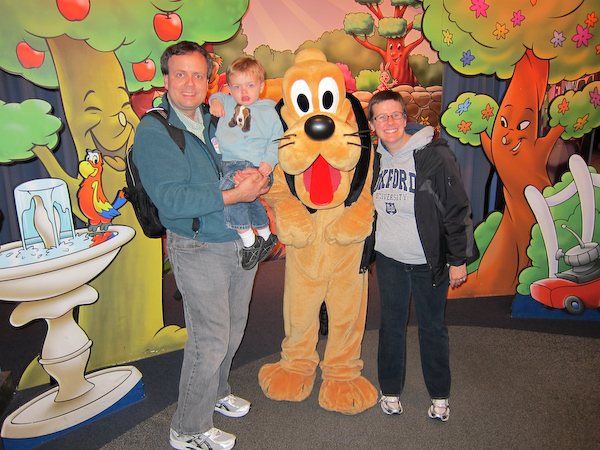 The lighting was a little odd with Pluto here. And there’s also the unfortunate timing shots. Despite what it looks like, I can assure you that Kevin is not stoned in this picture. Say Nope to Dope and Ugh to Drugs! Once again, we didn’t have an autograph book, so I’ll have to do that here at home.